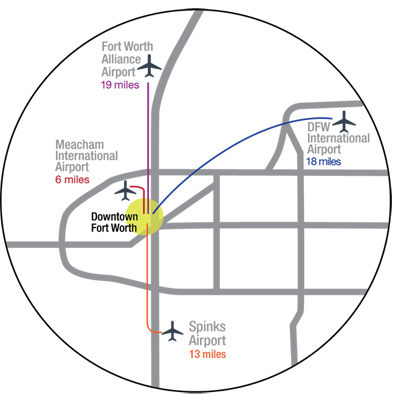 Downtown Fort Worth is only 18 miles from Dallas/Fort International Airport, one of the busiest airports in the world. DFW offers 229 nonstop destinations worldwide and 149 direct domestic connections. Fort Worth-base American Airlines is the largest carrier at DFW. Visit their site here. Land here and you're only five miles from Downtown. It provides four full-service fixed base operators, three maintenance facilities, and onsite rental car facilities. Visit their site here. This airport is located 13 miles south of Downtown and offers easy access to Interstate 35W. It includes a full-service fixed base operator, car rental, and maintenance facilities. Visit their site here. Located 19 miles north of Downtown, this airport features a vast array of flight services and is the cornerstone for the nation's fastest-growing industrial complex. Visit their site here.